I stopped running in October. We traveled to Texas for my brother's wedding and then the time changed and well, one thing led to another and here we are, over two months have passed. I've also gained 8lbs since the start of the school year (yay! go me!) (and I didn't know the actual number until all of these neurologist appointments...gah!). So I started running again over the break. I hate that I was on a good track and now it's like starting all over. Big sigh. Such is life though, right? Neurologist update: I had the MRI, I had the post MRI consultation and the big news is that there is a "near complete absence of the septum pellucidum." Supposedly, that's somewhat rare and a complete chance finding. And it has nothing to do with my migraines. Awesome. The Pendley's are CHOOSING JOY this year! It's January 4th and I can already tell you that it was much easier to choose joy when I thought I was just redoing our living room mantel. Now that I'm living it, I can tell you...it's hard. We have 2 middle school age DAUGHTERS in our house (oh the drama, oh the mood swings) and a very needy, very charming, very talkative kindergartener. We have a lot going on in our lives and sometimes we get in a slump where it is easier to give into a black cloud than it is to count our blessing and find JOY in things. To choose joy over anything else. 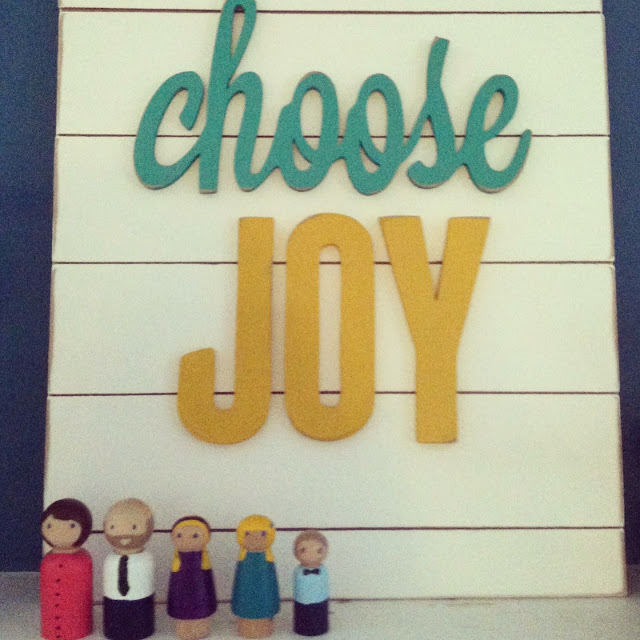 But we're going to do this - choose joy - in 2014. All of us. But, in looking at these things, I stumbled upon this blog and I'm SUPER excited about her menus and meals and grocery shopping lists and general awesomeness. So, 2014. Here we go. And as a PS - one of my bridesmaids was a dear friend named Joy...and choosing Joy makes me think of her...and she's in Korea...but every time I think JOY I am thankful for her. So please share the blog that has motivated you! Angie- I have always enjoyed reading your blog and am glad you are finding time to write again. I like the idea of choosing "JOY." I am perfectly happy taking walks, rather than running, and I don't get those side pains nor nearly so winded. Alas, it doesn't help with my slow and steady weight gain, but it does make me feel good. Happy New Year! Hi Angie, I found your blog via your shop. I wanted to tell you that I have been trying to shake a few extra pounds myself. And instead of spending money until I know what I want to do for sure, I've been using youtube videos. So far its just been yoga for me, but I'm happy with the 15 mins of free help to get me motivated to exercise. Happy New Year! It does make me feel good. Happy New Year!